Sidney Crosby is healthy. Sidney Crosby is dominant. Sidney Crosby is pulling moves so slick they’re hard to comprehend (even in slowed-down gif form!) against some of the best defensemen in the league. Really. Check it out. But it’s Evgeni Malkin who is really making a case for the Hart Trophy this year. There are some who will make the claim that it’s hard to award the Hart to a player on a team with a second superstar. Someone else who might make the team tick, or might have a bigger effect. Ovechkin and Backstrom get cited in this category quite often (though I’ll note the discussions haven’t stopped Ovechkin from winning the award a whopping three times in his career). As linemates, it makes some sense. Linemates spend enough time together that it’s hard to get a large sample of how they play with other people, and how do you give an award to one person for what might be good chemistry? Though they play on the same team, this problem doesn’t exist with Crosby and Malkin. Although it’s hard to imagine where the Penguins might be without one of them, particularly this year when the team has little center depth to make up for their potential absences, this doesn’t mean that it’s hard to consider Malkin and Crosby as separate entities and view their contributions individually. On average, Crosby and Malkin play about one minute of even strength time together per game, and the Penguins’ power play, where they have seen most of their time together this year and in years past, isn’t padding their stats like it has in previous seasons. Of Malkin’s 841 even strength minutes to date, he’s spent half of them with Blake Comeau and a quarter of that time with Patric Hornqvist, while Nick Spaling, Brandon Sutter, Chris Kunitz, and Pascal Dupuis each have over 130 minutes on a line with Malkin. In short, it’s been a revolving door for Malkin and his linemates. To contrast, Crosby has seen much more stability in his linemates. He’s played 532 of his 880 minutes with Kunitz and over 320 minutes with each of David Perron and Patric Hornqvist. In that vein, Malkin’s greatest success this year might, in fact, be spending almost a fifth of his even strength minutes playing wing with Brandon Sutter and still managing to have put up the numbers he has. In their careers, both Crosby and Malkin have accomplished incredible feats with linemates who have been dubbed, at times, not good enough. Pascal Dupuis is one of the top points per 60 players in the league since 2011 and he accomplished that because of his time at Crosby’s side. What makes Crosby and Malkin so compelling is their ability to elevate not only their own play but also that of their linemates. For the Penguins this year, it’s Malkin who is doing more with less. He currently leads the league in points per game, with 1.12, surpassing Tyler Seguin’s 1.09 points per game and Crosby’s 1.08 points per game. Though he's playing without 40-goal-scorer James Neal, Malkin has already scored more points this year than he did last year, and the Penguins still have 17 games left to play. His shot attempts are up from last year, too. Malkin's high level of play is also helping his linemates. Offensively, playing with Malkin is the best thing that ever happened to Blake Comeau. Comeau’s points per 60 this year is 2.45, up from last year’s 1.38 points per 60 and the highest it’s ever been in his career. And with the caveat of a small sample size, Malkin’s linemates have generally put up better possession numbers with him than without him. 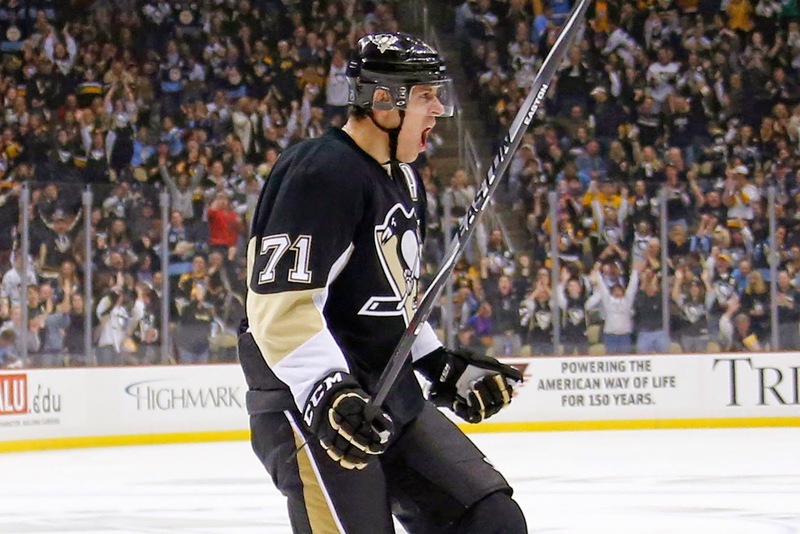 Looking at advanced stats, Malkin’s strong season continues. He’s posted a corsi for percentage of 55.1% and, his dCorsi impact, which adjusts for usage and other factors, is 54.72 (third on the team overall and second, behind Kunitz, among forwards). He has also exceeded usage expectations defensively as well, with a positive dCorsi against. The Hart Trophy is oftentimes won and lost in the second half of the season, when award voters are clouded by late success. Look to the lockout-shortened 2012-2013 season, and Ovechkin’s performance (and Crosby’s broken jaw), for a good example of this. Primacy and recency effect, anyone? In Malkin’s case, a strong finish, coupled with his strong start (where he started the season with an 11-game point streak), could help his case. If the last 10 games, during which he's been on a 1.3 points per game pace, are any indication of how he will close out the season, Malkin’s name should be fresh in voters’ minds. It’s a nice problem for the Pens to have, right? Malkin and Crosby are both at or near the top of the league in points per game, which should have them both in the conversation for the Hart. They’ve both been pretty healthy. At times, they’ve been magical. The Pens are lucky to have them both. This year, I’m voting Malkin. *If you haven’t watched Evgeni Malkin’s Hart Trophy acceptance speech, and the way Vince Vaughn utterly butchers his name, you’re missing out. Do yourself a favor and take a look.